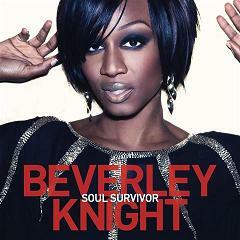 ‘The Soul Survivor EP’ is an iTunes exclusive and the latest release from the incomparable Beverley Knight, due on 8th March 2010. The lead track ‘Soul Survivor’ features Chaka Khan on vocals and was co-written by Beverley and Guy Chambers. The EP also includes the ridiculously AMAZING ‘Turned To Stone’, which, is a standout track from Beverley’s current album ‘100%’, as well as three live tracks including ‘Gold Chain’, ‘Bare’ and ‘100%’. A ferocious live performance of ‘Soul Suvivor’ was recorded in Sheffield during Beverley’s ‘100% Tour – Part 1’ back in November 2009. Beverley will play Part 2 of the tour in early April – ticket details are available from Beverley’s website by clicking here.